Each year, AMSOIL receives more than 500 hours of television coverage through its race and event partnerships. The coverage spans major networks, including CBS and ABC, as well as high-tier cable networks like ESPN, SPEED and Versus. A few of our partnerships also allow AMSOIL to rebroadcast these television shows on amsoilracing.com. Simply click the Media link at the top of the page. From there, you will see several icons that allow you to watch the entire 2010 Traxxas TORC Series presented by AMSOIL (including Scott Douglas’ AMSOIL Cup win), the complete 2010-2011 AMSOIL Championship Snocross Series and ATV 24/7. These shows are some of the bestproduced race programs ever assembled, and if you missed the original airings, you now have the chance to watch great racing from the comfort of your own home 24 hours a day, seven days a week. 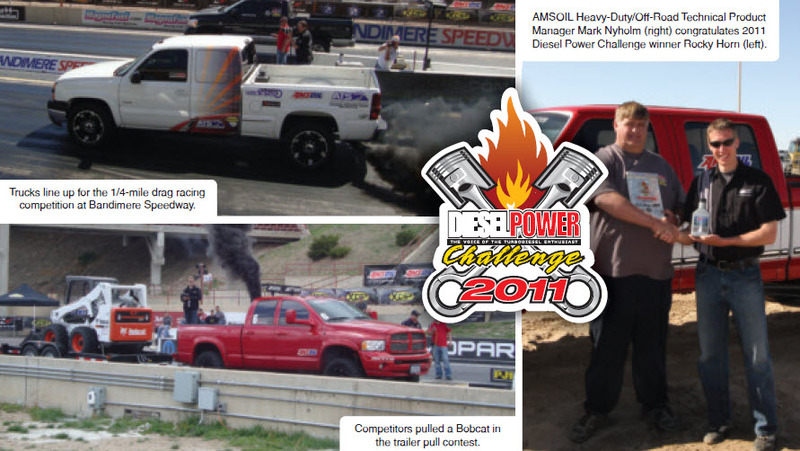 The 2011 AMSOIL-sponsored Diesel Power Challenge was held May 3-5 in Denver, Colo. Defending champion Dmitri Millard and his 2001 Chevy Silverado 2500 HD squared off against three Ford, three Dodge and three GM trucks selected from among hundreds of entries. The competition kicked off with a long day of dyno testing, where Millard posted the top numbers (1,314.8 HP / 2,391.7 lb/ft torque). Day-two events were conducted at Bandimere Speedway in western Denver. Joel Saunders and his 2006 Dodge Ram 2500 won the 1/4-mile drag racing competition (11.267 seconds @ 125.62 mph). The five-ton trailer pull took place in the afternoon, where Rocky Horn and his 1997 Ford F-350 powered by a Cummins engine finished on top (10.244 seconds @ 72.38 mph). With the field narrowed to five, the final challenges included a 150-mile fuel economy test. A 50,000-pound sled pull was held north of Denver at Keenesburg Fairgrounds. When the dust cleared following this final event, points were calculated and the drivers assembled for the awards presentation. Newly Tolf and his 2004 Chevy Silverado 2500 HD tied for fourth with Andy Parker and his 2008 Ford F-350 Super Duty. The fuel economy test served as the tie-breaker, and Parker was awarded fourth and Tolf fifth. Saunders earned the third-place trophy, Dustin West and his 2005 Dodge Ram 2500 captured second and Horn was named the 2011 Diesel Power Challenge champion, earning $500 in AMSOIL products and recognition in the pages of Diesel Power magazine this fall. AMSOIL is the Exclusive Official Oil of the Diesel Power Challenge. Complete results of the competition will be featured in upcoming issues of Diesel Power magazine and www.dieselpowermag.com. The AMSOIL supercross team headed to the season’s final event in Las Vegas with a chance to wrap up both the Lites East and Lites West championships. After taking his third win of the season in St. Louis, Justin Barcia had a firm 20-point lead over Dean Wilson in the Lites East standings, while teammate Eli Tomac strung together six straight podiums, including two wins, to close the gap on Lites West points leader Brock Tickle to just two points. Barcia quickly grabbed the hole shot in the East final and opened up a sizeable lead. Although a mid-race crash dropped him to third, Barcia continued his strong riding to take his ninth straight podium and cruise to the championship. In the West final, Tomac and Tickle kept one another in sight throughout all 15 laps. Although Tomac held the upper hand throughout the majority of the race, Tickle made the pass on lap 13 to finish second and take the championship. Tomac finished fourth in the final and second in the points standings. AMSOIL is the Exclusive Official Oil of Monster Energy Supercross. Team AMSOIL supercross rider Kevin Windham led the Las Vegas main event for much of the race before James Stewart rode over his head, crashed in the whoops section and essentially took him out. Windham suffered a spleen injury and was unable to finish the race. Despite the rough night, Windham continues to be the most popular rider in the sport, and he was presented with the Feld Motorsports Fans Choice award at Sunday night’s awards banquet. 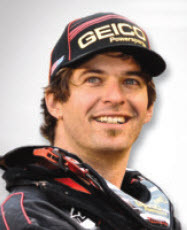 Windham plans to compete in the 2012 supercross season, and may enter a few Outdoor National events this summer.